Olay, previously Oil of Olay or Oil of Ulay, is an American skin care line. It is one of Procter & Gamble's multibillion-dollar brands. For the 2009 fiscal year, which ended on June 30, Olay accounted for an estimated $2.8 billion of P&G's $79 billion in revenue. Olay originated in South Africa as Oil of Olay. Graham Wulff (1916–2008), a former Unilever chemist from Durban, started it in 1952. He chose the name "Oil of Olay" as a spin on the word "lanolin", a key ingredient. 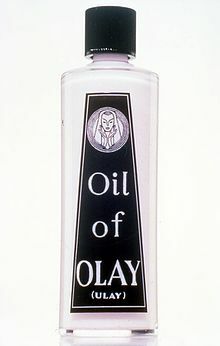 Olay's marketing was also unique, since it was never described as a moisturizer, nor even as beauty fluid. Nowhere on the packaging did it say what the product actually did. Print advertisements used copy such as "Share the secret of a younger looking you" and talked about the "beauty secret" of Oil of Olay. Other advertisements were written as personal messages to the reader from a fictitious advice columnist named Margaret Merril. They ran in Reader's Digest and newspapers and often looked like editorials. Wulff and Lowe, who ran the company under the banner of Adams National Industries (ANI), did not sell the product to the trade, but waited for pharmacies to ask for it based on consumer requests. As the company began to market the product internationally, it was decided to modify the name of the product in each country so it would sound pleasing and realistic to consumers. This led to the introduction of Oil of Ulay (UK and Ireland), Oil of Ulan (Australia) and Oil of Olaz (France, Italy, the Netherlands and Germany). In 1970, ANI opened a test market in the US (Chicago), and was expanding into northern Germany. Richardson Merrell Inc (later Richardson-Vicks Inc) acquired ANI in November 1970. RVI capitalized the "Oil" and added the sub-name "Beauty Fluid" to help protect the trade mark. They further added a sales force and created TV advertising. The company extended the product range to include items such as Night of Ulay and Beauty Cleanser, and expanded into more countries (Spain, France, and Germany). The result of Richardson Merrell's efforts was a dramatic increase in sales. However, as with many brands, the business was not managed uniformly so there were differences in performance between the countries. RVI was acquired by Procter & Gamble in 1985. P&G greatly expanded Olay both in lineup and internationally. Olay became P&G's 13th billion dollar brand in 2013. Since then, the range has been expanded to include a full range of hypoallergenic variants, cleansers and creams with the aim of meeting the full range of skincare needs, whatever the user's age or skin type. The brand also includes soap, and body wash. Olay Cosmetics was launched in 1996 but discontinued in 2001. In 1999, it was decided to unify the brand under a global name. Thus, Oil of Ulan and Ulay became Olay on a worldwide basis, except in German-speaking regions and Italy, where it remained "Oil of Olaz". In the Netherlands and Belgium, it was renamed just "Olaz". The Olay brand has expanded into a range of other products grouped into "boutiques" including Complete, Total Effects, ProX, Regenerist, Regenerist Luminous, Classics, Fresh Effects, Body (North America) and White Radiance (Asia). Olay is the market leader in many countries including the US, UK, and China. Olay has extended its heritage as a moisturizer to stay looking young, to formally creating the "anti-aging" category in mass stores with the launch of Total Effects in 1999. Active Hydrating Formula, generally the least expensive variety, bears the closest resemblance to the pink "Oil of Olay" marketed in the US before the P&G acquisition. The launch was almost double the typical price of a mass market moisturizer at the time. Today, there are numerous products on the market that are more expensive than Olay. But the U.S. consumer union said none of the creams tested produced a dramatic improvement. It advised that staying out of the sun or using skin products with a high sun protection factor was the best option. The consumer union said: "We found that after 12 weeks our top-rated products did smooth out some fine lines and wrinkles." However, it added: "Even the best performers reduced the average depth of wrinkles by less than 10 per cent, a magnitude of change was, alas, barely visible to the naked eye." Olay's current slogan is "Ageless". Previous slogans included "Your best beautiful", "Challenge what's possible" and "Love the skin you're in". In October 2000, Olay launched in the Philippines. In August 2007, Olay was launched in India. The Olay brand strives to understand more about the biology of skin and utilize large portions of their resources to research and development. Examples of their most recent research projects include the "Multi-Decade and Ethnicity Project", which was launched in 2012 with their partners, 23andMe. The objective of the project was to research the genealogical science of skin aging. The final results were presented to the 23rd World Congress of Dermatology in June 2015. In August 2016, Olay launched a new innovative tool called the Skin Advisor, designed to help consumers find the right product for their exact skin type. After uploading a selfie and answering some skin care questions, the Skin Advisor will analyze your skin, tell you your skin age and provide product recommendations for any problem areas. Olay uses many different ingredients in the production of their skin care line. The main ingredients used include retinyl propionate (vitamin A derivative), glycerin, niacinamide (vitamin B3), broad spectrum sunscreen, and amino peptides. Some of the products also include more hazardous ingredients, such as triethanolamine, propylparaben, benzyl salicylate, butylphenyl methylpropional (also called Lilial), hydroxyisohexyl 3-cyclohexene carboxaldehyde, and polyethylene glycol-4 dilaurate. In 2011, Olay ranked in 1st place among 50 of the industry leaders in Brand Finance's Top 50 Cosmetic Brands. The most recent report for 2015 has Olay ranking 9th in the Top 50. ^ Byron, Ellen (2010-01-07). "Olay Highlights P&G's Push to Extend Brands". Wall Street Journal. ISSN 0099-9660. Retrieved 2016-07-21. ^ a b "Cosmetics and Skin: Company Timeline". cosmeticsandskin.com. Retrieved 2016-07-21. ^ "A Company History" (PDF). Procter and Gamble. Procter and Gamble. Retrieved 21 July 2016. ^ "2013 Annual Report" (PDF). Procter and Gamble Annual Reports. Procter and Gamble. Retrieved 21 July 2016. ^ "OIL OF OLAY gets a makeover". INTA Bulletin. International Trademark Association. 1 July 2000. Retrieved 2016-09-21. ^ "Olay Discovers Unique Skin Fingerprint | Olay". www.olay.com. Retrieved 2016-07-21. ^ "23rd World Congress of Dermatology | June 8–13, 2015". derm2015.org. Retrieved 2016-07-21. ^ "Olay's new digital tool will help you find the perfect skincare - Stylus Life". Retrieved 2016-09-02. ^ "Skin Advisor: Skin Transformation in Your Hands | Olay - Trend Style". 2016-09-01. Retrieved 2016-09-02. ^ a b "Search by product name". CosDNA.com. Retrieved 2016-09-21. ^ "BrandFinance Top 50 Cosmetics Brands - 2011 (Brand Finance) | Ranking The Brands". Retrieved 2016-07-21. ^ http://www.include-digital.com, Include -. "Best Global Brands | Brand Profiles & Valuations of the World's Top Brands". brandirectory.com. Retrieved 2016-07-21.